If you are seeking a great way to improve the comfort and appeal of your home, you may want to consider installing a brand new fireplace . A new stone fireplace will provide you and your family with a central gathering place in your living room, and your fireplace doors and stone mantel can complement the overall style of your interior space. A company specializing in the installation of fireplace in Chantilly can help you create the stone fireplace of your dreams. To help you get started on your new fireplace project, here is a look at some ideas for your brand new stone fireplace. Natural stone can be used to provide your fireplace with a rustic look and feel. When you are designing your new stone fireplace , you may want to select stones that have a very natural look. Your stone mantel can also be accented by other naturally occurring materials, such as wood. By bringing nature into your home, you will create a charming fireplace that you and your guests are sure to love. Smooth and seamless lines can provide your stone fireplace with a sense of tranquility and calm. If you are seeking a more modern look for your stone fireplace installation, you may want to choose stones that have a smooth and uncluttered look. By creating a fireplace that has simple lines, you can also allow other features of your living room to stand out. Your new fireplace installation can be an extension of your unique style. As you are drawing inspiration for your stone fireplace, you may want to look at custom fireplace creations. As you are selecting materials for your fireplace, you will have the option of picking out mixing and matching stones and materials. With careful selection, different materials can be beautifully incorporated into your overall fireplace design. As you are creating a design scheme for your living room, it is critical to consider your fireplace installation. A fireplace can infuse any interior space with cozy cheer. During your fireplace installation, you will have many different factors to consider. For example, fireplace mantels and doors are available in a variety of colors, shapes, and sizes. In addition, you will need to decide whether gas logs will be the best fit for your home. From stone fireplaces to contemporary fireplaces, the sky is the limit when it comes to your fireplace design ideas. A company offering fireplace in Chantilly can answer all of your questions about your new fireplace design. To learn how to choose the right fireplace for you, check out this video from HBTV. A home should feel safe, comfortable, and cozy, and there are countless ways that you can achieve these elements. A warm fireplace in Chantilly with an inviting hearth and a decorated mantel is always a good place to start. Keep reading if you are interested in learning how to make your home cozy with a stone fireplace. 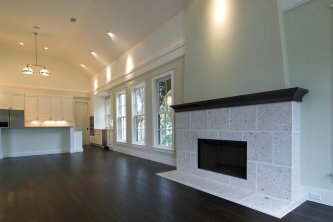 A fireplace or stove can require a substantial amount of space within your home, even if you choose a small unit. If you want to make the most of your space it is a good idea to invest in a fireplace that can serve multiple purposes, especially if your living space is not particularly expansive in the first place. Consider going with a stone fireplace that features a raised foundation; working with the vertical space in your home allows you to leave some room to move around in smaller living spaces. You can keep extra logs or even family board games in the storage space that is available under the raised hearth. 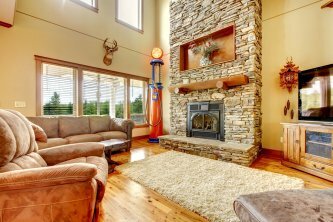 A multi-functioning stone fireplace can help save space while still offering a gathering area where the family can relax. Fireplaces are natural attention grabbers and thus do an exceptional job of enhancing a living space’s aesthetic appeal . Focus on this quality when you design your stone fireplace. Custom fireplaces can be made to fit the themes that are already present within your living space, allowing for a seamless integration when you have your fireplace installed. Consider the way you can design and decorate your mantel in order to further the existing aesthetic of your living space. If your family loves decorating for the holidays, the mantel above your stone fireplace is a perfect place to start. Your fireplace can’t be too cozy if it doesn’t keep you warm. Consider a dense soapstone fireplace that can heat your room slowly and steadily over the course of many hours. Since the soapstone absorbs the heat from the fire and then transmits it into the room, the heating properties may last long after the fire has stopped burning. If you are a homeowner with plenty of space in your backyard, you may be interested in designing an outdoor living room. There are a number of ways to design this type of space, but a few essential components are necessary: Be sure to include comfortable seating for your guests, some sort of visual stimulus, and outdoor heating in Chantilly. Here are a few tips for designing your outdoor living room. 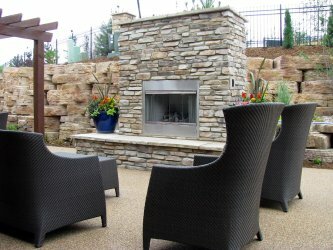 It is important to provide a heat source in your outdoor living room, especially if you plan on making use of it all year round. It is just this type of situation in which a fireplace thrives. A natural gas fireplace can keep your outdoor living room at a comfortable temperature , and many models use blowers for improved heat circulation. This heat source is perfect for nights when you host a gathering for your friends and family as well as those occasions when you would like to simply enjoy some alone time sitting around the hearth. A fireplace may provide more than just heat; it can also serve as an enjoyable and entertaining focal point. Consider dressing your mantel with candles to add a warm aesthetic to your outdoor living room. A focal point helps to tie the living room together by directing the attention of its occupants. While indoor focal points are typically pieces like televisions and wall art, you have a bit more freedom to explore your creativity in an outdoor living room. The focal point of an outdoor living room may be your swimming pool, a pond, or your cooking area where you set up your grill. The more room you have in your backyard, the more freedom you have to let your creativity go to work. Make sure that you have adequate seating before you invite guests to your outdoor living room. This means that not only should you have enough places for everyone to sit down, you should also have different types of seating to suit the various personalities of your friends and families. Provide benches as well as individual chairs for stationary and mobile seating. A fireplace in Chantilly can be a luxury; in addition to providing heat and comfort, it also presents the homeowner with an opportunity to add to the aesthetic of the room. Fireplace design can change the atmosphere of a room in creative ways. Watch this video for a few tips for decorating your mantel. If you and your family love sitting and relaxing around the hearth, do what you can to make the mantel an interesting focal point. You can hang mirrors, pictures, or pieces of landscape art above your mantel while layering smaller pieces on top of it. Hang stockings from the mantel or arrange snow themed figurines on top in time for the holidays. You can also experiment with different colors to add a modern flair to your traditional fireplace design; cover small parts of the mantel with wallpaper to change up your design in a creative manner. How Do Gas Logs Work?